Introduced in light of the ballistic missile threat from mainly Pakistan, it is a double-tiered system consisting of two land and sea-based interceptor missiles, namely the Prithvi Air Defence (PAD) missile for high altitude interception, and the Advanced Air Defence (AAD) Missile for lower altitude interception. The two-tiered shield should be able to intercept any incoming missile launched 5,000 kilometres away. The system also includes an overlapping network of early warning and tracking radars, as well as command and control posts. The PAD was tested in November 2006, followed by the AAD in December 2007. With the test of the PAD missile, India became the fourth country to have successfully developed an anti-ballistic missile system, after United States, Russia, and Israel. The system has undergone several tests but system is yet to be officially commissioned. Since the early 90s, India has faced the threat of ballistic missile attacks from Pakistan against which it has fought multiple wars in the past and also from China. With the heightening of tensions in the region, and in response to Pakistan’s deployment of M-11 missiles bought from China, the Indian Government in August 1995 procured six batteries of Russian S-300 Surface-to-air missiles to protect New Delhi and other cities. In May 1998, India for the second time (since its first test in 1974) tested nuclear weapons ( Pokhran-II), followed by Pakistan ( Chagai-I) with its first-ever nuclear test. With Pakistan’s testing of nuclear weapons and missile delivery systems, this threat intensified. India has also developed and tested missile delivery systems ( IGMDP). In 1999, the Kargil War between India and Pakistan became the first direct conflict between two declared nuclear powers. As the war progressed, the first hint of the possible use of a nuclear weapon was on 31 May, when Pakistani foreign secretary Shamshad Ahmad made a statement warning that an escalation of the limited conflict could lead Pakistan to use “any weapon” in its arsenal. This was immediately interpreted as an obvious threat of a nuclear retaliation by Pakistan in the event of an extended war. The leader of Pakistan’s senate noted that “the purpose of developing weapons becomes meaningless if they are not used when they are needed.” Some experts believe that following nuclear tests in 1998, Pakistani military was emboldened by its nuclear deterrent cover to markedly increase coercion against India. Development of an anti-ballistic missile system began in late 1999, suggesting that India initiated the programme in light of Pakistan’s eschewing of a nuclear No first use policy and heightened tensions during the Kargil war including a possibility of full-scale nuclear war. Phase-I of the system will enable interception of missiles up to a 2,000-km range, which will be extended to 5,000-km range in Phase-II. Development of the anti-ballistic missile system began in 1999. Around 40 public and private companies were involved in the development of the systems. They include Bharat Electronics Ltd and Bharat Dynamics Ltd, Astra Microwave, ASL, Larsen & Toubro, Vem Technologies Private Limited and KelTech. Development of the LRTR and MFCR (Multi-function Fire Control Radar) was led by Electronics and Radar Development Establishment (LRDE). Defence Research and Development Laboratory (DRDL) developed the mission control software for the AAD missile. Research Centre, Imarat (RCI) developed navigation, electromechanical actuation systems and the active radar seeker. Advanced System Laboratory (ASL) provided the motors, jet vanes and structures for the AAD and PAD. High Energy Materials Research Laboratory (HEMRL) supplied the propellants for the missile. Two new anti ballistic missiles that can intercept IRBMs are being developed. These high speed missiles (AD-1 and AD-2) are being developed to intercept ballistic missiles with a range of around 5,000 km (3,100 mi). The new missile will be similar to the THAAD missile deployed by the US. These missiles will travel at hypersonic speeds and will require radars with scan capability of over 1,500 km (930 mi) to successfully intercept the target. On 6 May 2012, Dr V K Saraswat while confirming the completion of Phase-I added that Phase-II would be completed by 2016 to protect against missiles having range up to 5000 km. India is also planning to develop a laser based weapon system as part of its defence to intercept and destroy missiles soon after they are launched towards the country. DRDO’s Air Defence Programme Director V K Saraswat says its ideal to destroy a ballistic missile carrying nuclear or conventional warheads in its boost phase. Saraswat further added that it will take another 10–15 years for the premier defence research institute to make it usable on the ground. The two-tiered BMD System consists of the PAD, which will intercept missiles at exo-atmospheric altitudes of 50–80 km (31–50 mi) and the AAD missile for interception at endo-atmospheric altitudes of up to 30 km (19 mi). The deployed system would consist of many launch vehicles, radars, Launch Control Centres (LCC) and the Mission Control Centre (MCC). All these are geographically distributed and connected by a secure communication network. The MCC is the software intensive system of the ballistic missile defence system. It receives information from various sources such as radars and satellites which is then processed by ten computers which run simultaneously. The MCC is connected to all other elements of the defence through a WAN. MCC performs target classification, target assignment and kill assessment. It also acts as a decision support system for the commander. It can also decide the number of interceptors required for the target for an assured kill probability. After performing all these functions, the MCC assigns the target to the LCC of a launch battery. The LCC starts computing the time to launch the interceptor based upon information received from a radar based on the speed, altitude and flight path of the target. LCC prepares the missile for launch in real time and carries out ground guidance computation. After the interceptor is launched, it is provided target information from the radar through a datalink. When the interceptors close onto the target missile, it activates the radar seeker to search for the target missile and guides itself to intercept the target. Multiple PAD and AAD interceptors can be launched against a target for high kill probability. The Prithvi Air Defence (PAD) is an anti-ballistic missile developed to intercept incoming ballistic missiles outside the atmosphere (exo-atmospheric). Based on the Prithvi missile, PAD is a two-stage missile with a maximum interception altitude of 80 km (50 mi). The first stage is a Solid fuelled motor while the second stage is Liquid fuelled. It has manoeuvre thrusters which can generate a lateral acceleration of more than 5 gs at 50 km (31 mi) altitude. Guidance is provided by an intertial navigation system with mid-course updates from LRTR and active radar homing in the terminal phase. PAD has capability to engage the 300 to 2,000 km (190 to 1,240 mi) class of ballistic missiles at a speed of Mach 5. LRTR is the target acquisition and fire control radar for the PAD missile. It is an active phased array radar having capability to track 200 targets at a range of 600 km (370 mi). The PAD missile has also been called Pradyumna. Further development led to the improvement of the interception range from 50 to 80 km (31 to 50 mi). The improved missile will utilise a gimbaled directional warhead, a technology also used by Israel, the US and Russia. This technology allows for a smaller warhead to destroy the target missile. The PADE (Prithvi Air Defence Exercise) was conducted on November 2006 in which a PAD missile successfully intercepted a modified Prithvi-II Missile at an altitude of 50 km (31 mi). 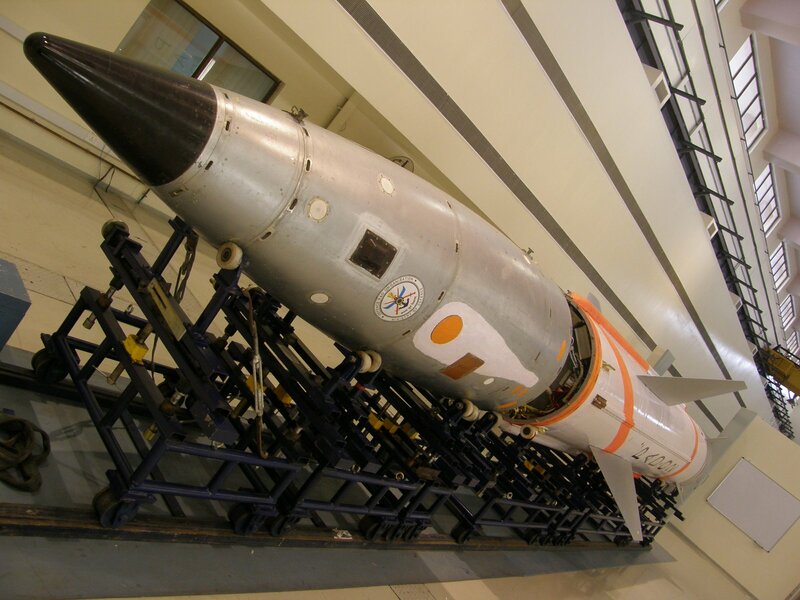 The Prithvi-II ballistic missile was modified successfully to mimic the trajectory of M-11 missiles. DRDO plans to test the anti-ballistic shield against missiles with a range of 1,500 km (930 mi). The test will be conducted with a modified Prithvi missile launched from a naval ship and the anti-ballistic missile launched from Wheeler Island. The interception of the target missile will take place at approximately 80 km (50 mi) altitude. On 6 March 2009 DRDO carried out a second successful test of the PAD interceptor missile. The target used was ship launched Dhanush missile which followed the trajectory of a missile with range of a 1,500 km (930 mi). The target was tracked by Swordfish (LRTR) radar and destroyed by the PAD at 75 km (47 mi) altitude. On 6 March 2011 DRDO successfully test-fired interceptor missile from Advanced Air Defence (AAD) which destroyed a ‘hostile’ target ballistic missile, a modified Prithvi, at an altitude of 16 km over the Bay of Bengal. Advanced Air Defence (AAD) missile positioned at Wheeler Island, about 70 km across sea from Chandipur, received signals from tracking radars installed along the coastline and travelled through the sky at a speed of 4.5 Mach to destroy it. Advanced Air Defence (AAD) is an anti-ballistic missile designed to intercept incoming ballistic missiles in the endo-atmosphere at an altitude of 30 km (19 mi). AAD is a single-stage, solid-fuelled missile. Guidance is similar to that of PAD: it has an inertial navigation system, midcourse updates from ground based radar and active radar homing in the terminal phase. It is 7.5 m (25 ft) tall, weighs around 1.2 t (1.2 long tons; 1.3 short tons) and a diameter of less than 0.5 m (1 ft 8 in). On 6 December 2007, AAD successfully intercepted a modified Prithvi-II missile acting as an incoming ballistic missile enemy target. The endo-atmospheric interception was carried out at an altitude of 15 km (9.3 mi). The interceptor and all the elements performed in a copy book fashion validating the endo-atmospheric layer of the defence system. The launch was also shown through a video link at a control room of DRDO Bhawan,at Delhi. The sequence of events of the test was as follows. At 11 am the Prithvi (missile) lifted off from Launch Complex III at the Integrated Test Range (ITR) at Chandipur Odisha. Radars at Konark, Paradip detected the missile and were continuously tracking it. The target information was sent to MCC for further processing. MCC classified the target, calculated the trajectory of the missile and assigned the target to a AAD battery located on Abdul Kalam island (Wheeler Island), 70 km (43 mi) across the sea from Chandipur. 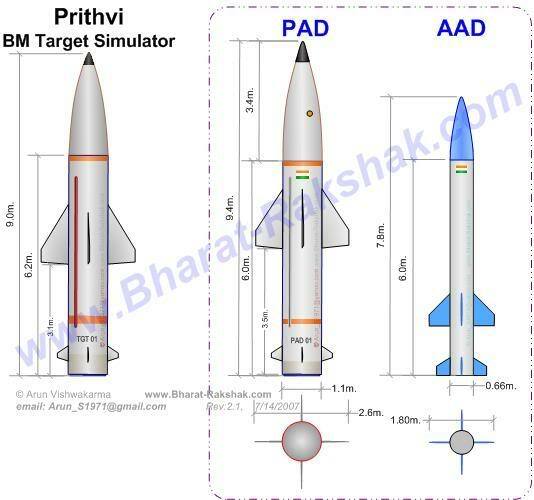 The AAD was launched when the Prithvi reached an apogee of 110 km (68 mi). The AAD with the help of midcourse updates and its terminal seeker manoeuvres itself towards the target. AAD makes a direct hit at an altitude of 15 km (9.3 mi) and at a speed of Mach 4. Radars detected formation of a large number of tracks, signifying that the target had broken into multiple pieces. The thermal cameras located on Wheeler Island also picked up the direct hit through thermal images. Due to two successful interceptor missile tests carried out by India, the scientists have said that the AAD missile could be modified into a new extended range (up to 150 km (93 mi)) surface-to-air missile that could be possibly named as ‘Ashwin’. On 15 March 2010, AAD interceptor missile test from the Odisha coast on Monday was aborted, as the target missile deviated from its path and plunged into the sea. The AAD missile was to intercept the target at an altitude of 15 to 20 km over the sea. The target, a Prithvi missile, fired at 10:02 am from a mobile launcher from the Integrated Test Range Complex-3 at Chandipur-on-Sea, 15 km from here, deviated from its trajectory after travelling about 11 km and fell into the sea. On 26 July 2010, AAD was successfully test-fired from the Integrated Test Range (ITR) at Wheeler Island off the Odisha’s east coast. On 6 March 2011, India launched its indigenously developed interceptor missile from the Odisha coast. India successfully test-fired its interceptor missile which destroyed a ‘hostile’ target ballistic missile, a modified Prithvi, at an altitude of 16 km over the Bay of Bengal. the interceptor, Advanced Air Defence (AAD) missile positioned at Wheeler Island, about 70 km across sea from Chandipur, received signals from tracking radars installed along the coastline and travelled through the sky at a speed of 4.5 Mach to destroy it. As the trial was aimed at achieving the desired result with precision, the interceptor missile had its own mobile launcher, secure data link for interception, independent tracking and homing capabilities and sophisticated radars. “It was a fantastic launch. The trial, conducted from two launch sites of ITR off Orissa coast for developing a full fledged multi-layer Ballistic Missile Defence (BMD) system, was fully successful,” he said. 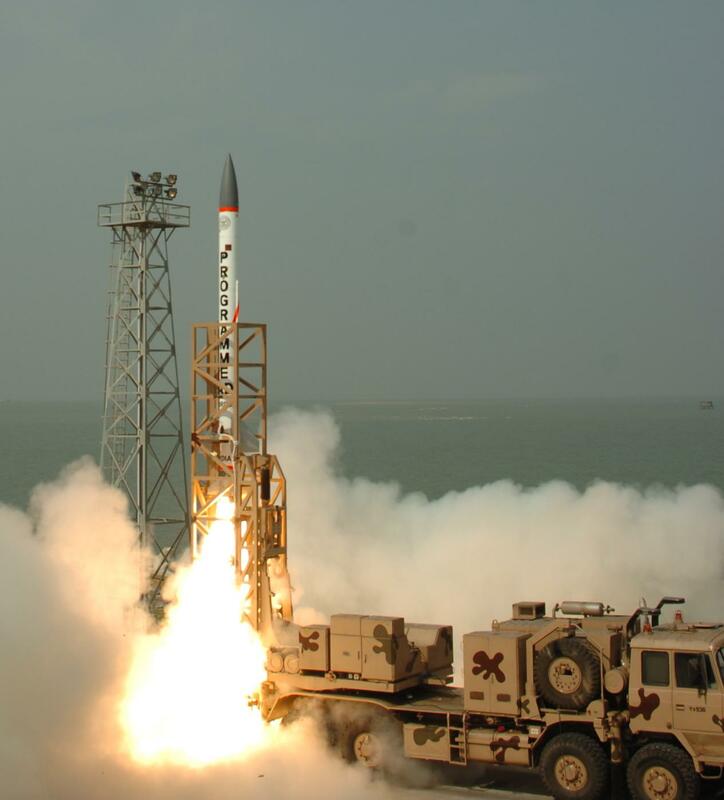 On 10 February 2012, AAD was again successfully test-fired from Wheeler Island off the state coast near Dhamra in Bhadrak district, about 170 km from Bhubaneswar. On 6 April 2015 an improved AAD was tested. The missile was launched from a canister for the first time and the composite rocket motor fired successfully. The missile had improvements over the previous version in terms of bigger warhead, improved maneuverability and reduced mis-distance. As the missile was in the air one of the sub systems malfunctioned making it veer away from the flight path resulting in the failure of the mission. Another test is supposed to take place within 30–45 days after detecting and resolving the problem. On 22 November 2015 an upgraded version of AAD ( Advanced Air Defence) was successfully tested. The anti-ballistic missile took off at 9.40 a.m. from the A.P.J. Abdul Kalam (Wheeler) Island soon after it received the command to waylay and destroy an incoming electronically simulated target missile.Conditions similar to the launch of a target missile from Balasore were simulated electronically and upon receiving its coordinates, the interceptor missile, travelling at supersonic speed, engaged and destroyed the “virtual target” in mid-flight. On 15th May 2016, DRDO officially reported that AAD intercepted and destroyed a Prithvi ballistic missile fired from a ship. Swordfish is the target acquisition and fire control radar for the BMD system. The LRTR currently has a range of 600 km (370 mi) to 800 km (500 mi) and can spot objects as small as a cricket ball. The DRDO plans to upgrade the capacity of Swordfish to 1,500 km by 2011. In 2009, reports emerged of a new exo-atmospheric interceptor missile named the Prithvi Defence Vehicle (PDV) interceptor missile. The DRDO is developing a new Prithvi interceptor missile codenamed PDV. 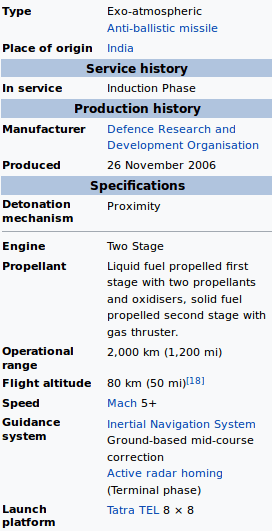 It will be a two-stage missile and both the stages will be powered by solid propellants. It will have an innovative system for controlling the vehicle at an altitude of more than 150 km The PDV is intended to replace the existing PAD in the PAD/AAD combination. It will have an IIR seeker for its kill vehicle as well. The PDV will replace the PAD with a far more capable missile and will complete the Phase 1 of the BMD system, allowing it to be operational by 2013. Whereupon Phase 2 development will take over for protection against missiles of the 5,000 km (3,100 mi) range class. The PDV is designed to take out the target missile at altitudes above 150 km (93 mi). On 27 April 2014 first PDV was successfully test conducted by DRDO. On 11 February 2017, DRDO successfully conducted second test for PDV missile. According to scientist V K Saraswat of DRDO the missiles will work in tandem to ensure a hit probability of 99.8 percent. On 6 May 2012, Dr V K Saraswat confirmed that Phase-I is complete and can be deployed to protect two Indian cities at a short notice. He also added that Phase-I is comparable to PAC-3 system. New Delhi, the national capital, and Mumbai, have been selected for the ballistic missile defence shield. After successful implementation in Delhi and Mumbai, the system will be used to cover other major cities in the country. This shield can destroy incoming ballistic missiles launched from as far as 2,500 km (1,600 mi) away. When the Phase II is completed and PDV is developed, the two anti-ballistic missiles can intercept targets from up to 5,000 km (3,100 mi) both at exo and endo-atmospheric (inside the atmosphere) regions. The missiles will work in tandem to ensure a hit probability of 99.8 per cent. Defending against an attack by a cruise missile on the other hand is similar to tackling low-flying manned aircraft and hence most methods of aircraft defence can be used for a cruise missile defence system. Barak-8 is a long-range anti-air and anti-missile naval defence system being developed jointly by Israel Aerospace Industries (IAI) and the Defence Research and Development Organisation (DRDO) of India. The Indian Army is considering induction of a variant of Barak 8 missile to meet its requirement for a medium-range surface-to-air air defence missile. The naval version of this missile has the capability to intercept incoming enemy cruise missiles and combat jets targeting its warships at sea. It would also be inducted into the Indian Air Force, followed by the Army. India has a joint venture for this missile with Israel. Recently developed, India’s Akash missile defence system also has the capability to “neutralise aerial targets like fighter jets, cruise missiles and air-to-surface missiles”. On 17 November 2010, in an interview Rafael’s Vice President Mr. Lova Drori confirmed that the David’s Sling system has been offered to the Indian Armed Forces. How Can We Prepare the Future Generation for Interstellar Travel?